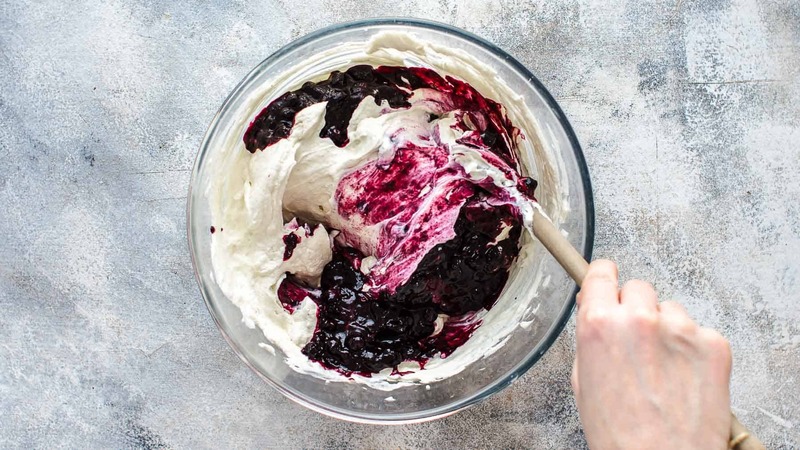 This No-Bake Blueberry Cheesecake is very easy to make and super delicious. You need just 9 ingredients. 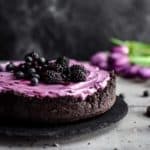 It comes with a super creamy blueberry filling made with homemade blueberry sauce from scratch and a no-bake Oreo cookie crust. Lots of step-by-step photos and video included. 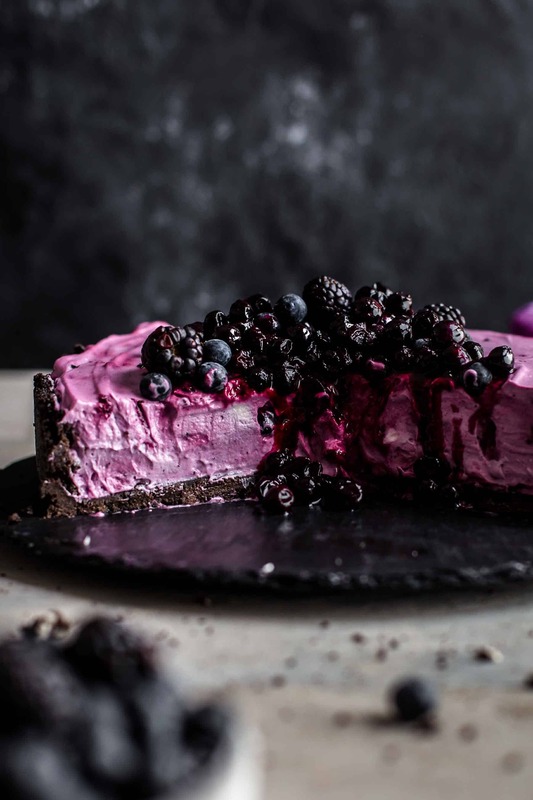 No-bake cheesecakes are always a great treat, no matter if it is summer or winter. They are dreamy creamy and oh so delicious. 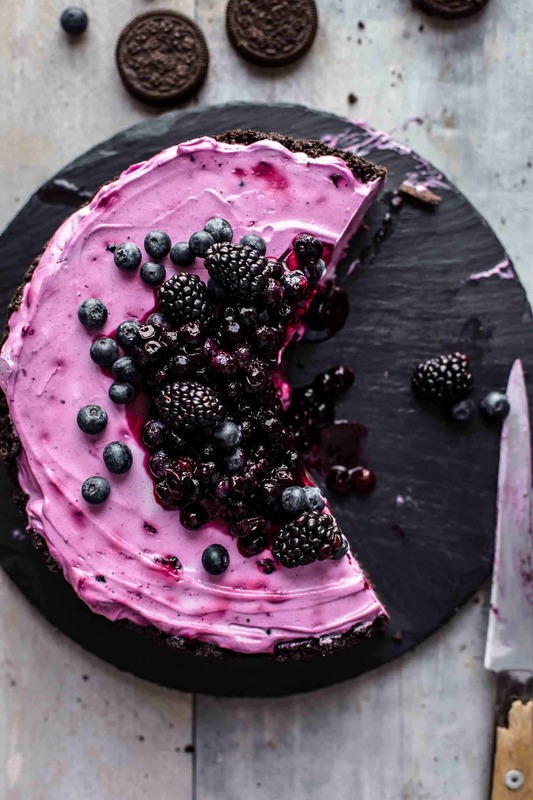 This No-Bake Blueberry Cheesecake is my new favorite. 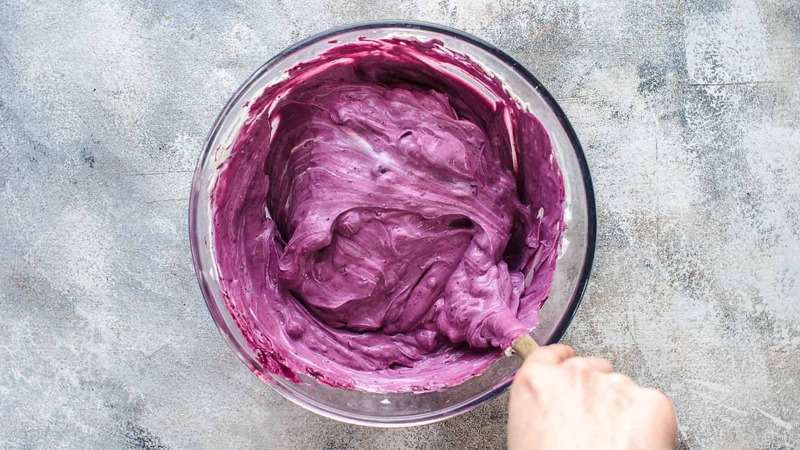 The blueberry taste is super intense, and the filling is so creamy, velvety, and smooth that I would love to lay in there. Because I love to bake from scratch, I added homemade blueberry sauce to the filling. You could substitute with blueberry jam, but I really encourage you to make the blueberry sauce on your own. You need just 3 ingredients and it’s very easy to make. 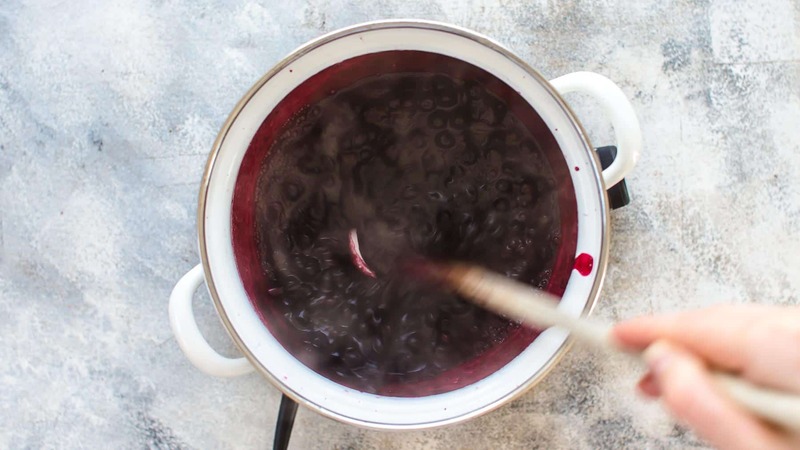 Combine blueberries, sugar, and lemon juice in a heavy-bottomed pot and bring over medium heat to a simmer. You can use fresh (recommended) or thawed blueberries. Use freshly squeezed lemon juice. Cook for about 5 minutes until it thickens and is reduced by about 1/3. Stir constantly. When you start seeing the bottom of the pan while stirring, you know the sauce is done. Once cooled, the sauce should be like syrup with soft blueberries. If it is too liquid after it cooled down, you may want to bring it back to simmer and cook it 1-2 minutes longer. If it is too firm, you can stir in 1-2 tbsp of water to liquify it again. But it’s better to have it thicker and not too watery because it would harm the texture of the cheesecake. Crush Oreo cookies with the filling into fine crumbs. You can do this by using a food processor, or you fill them into a zip-top bag and smash them with the rolling pin. Then transfer to a large bowl and add melted butter. Stir until evenly moist. Because of the butter and the filling of the Oreo cookies, the crust will hold together without the need to bake it. 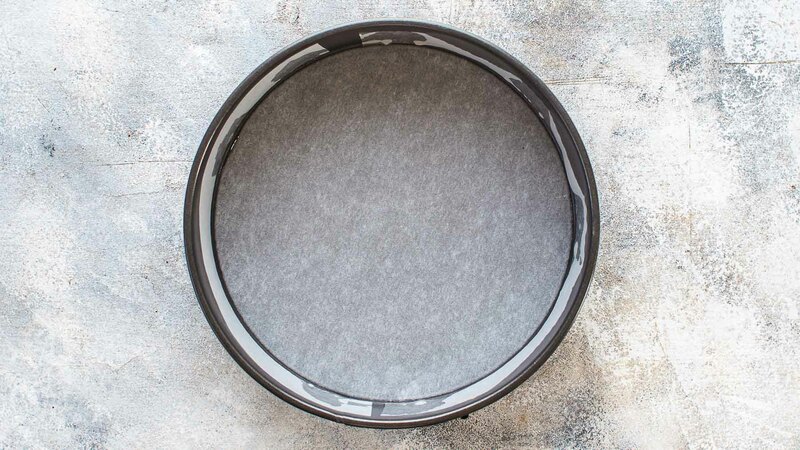 Line a 9″ (23cm) springform pan with parchment paper. I recommend lining the bottom and the sides of the pan for easier removing after chilling. Here is a detailed tutorial on how to line springform pan. A springform pan should be the pan of your choice. Otherwise, you won’t be able to remove the cake from the pan as a whole and cutting is also almost impossible. 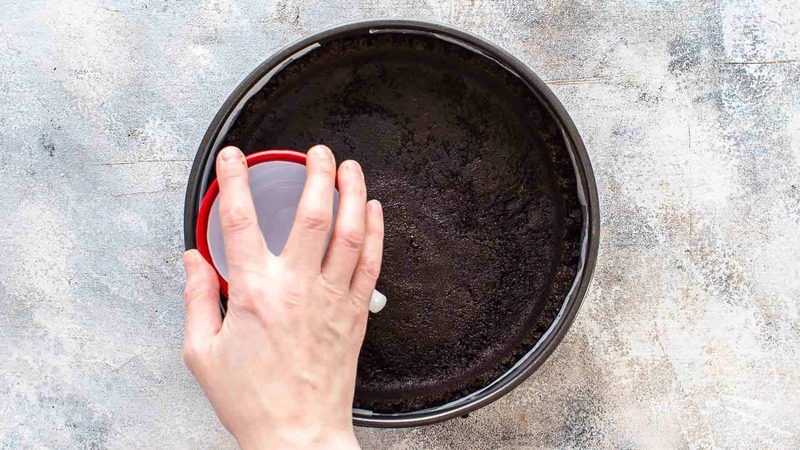 Transfer the Oreo cookie crust to the prepared pan and firmly press with a flat-bottomed cup into the bottom and halfway up the sides of the pan. Freeze until you are done with the filling. Start with mixing the heavy cream until stiff peaks form. Be careful that you don’t overmix it or it will curdle. You get the best mixing results when the cream is very cold (straight out of the fridge). The bowl and mixing attachment should also be cold. So don’t use a bowl straight out of the dishwasher which is still warm. 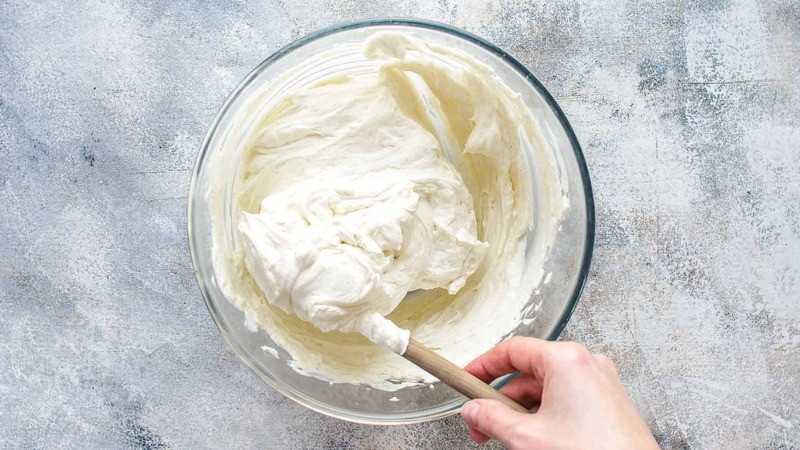 In a large bowl, beat cream cheese until it’s creamy for about 1-2 minutes. You can use brick-style cream cheese (available in the US) or spreadable cream cheese (available in the EU). The recipe works either way. 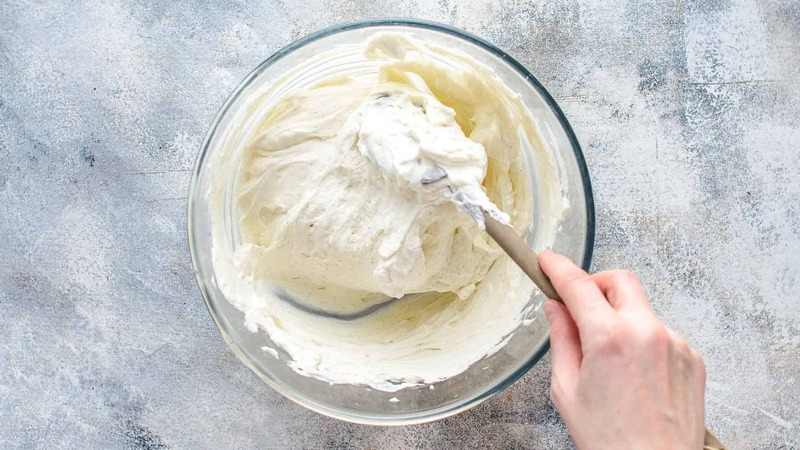 If using brick-style cream cheese, I recommend to let it come to room temperature that it incorporates better with the other ingredients without mixing it too long. 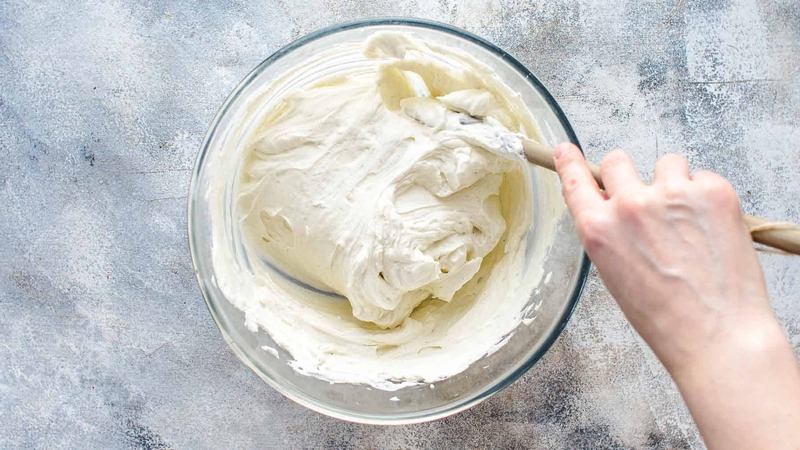 Spreadable cream cheese is already soft and should be used straight out of the fridge. Add sugar and vanilla and mix until combined, smooth and no lumps remain. Then add whipped cream and fold into the cream cheese. 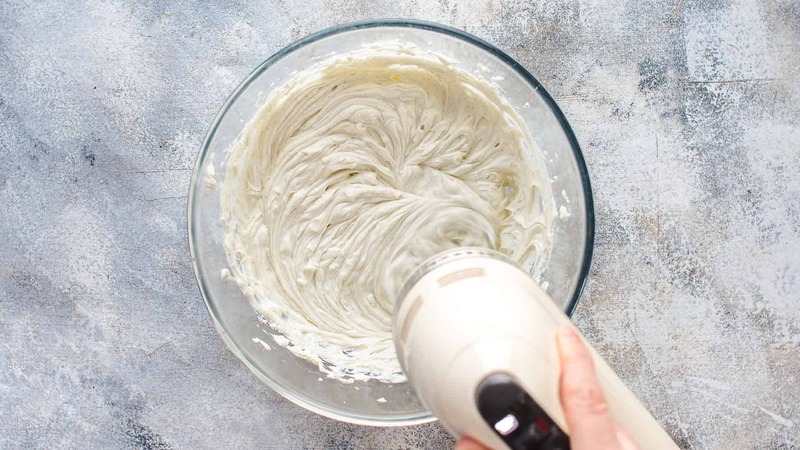 Afraid of folding something like egg whites or whipped cream into a cream or batter? You don’t need to. It’s actually quite easy. I show you how it works. 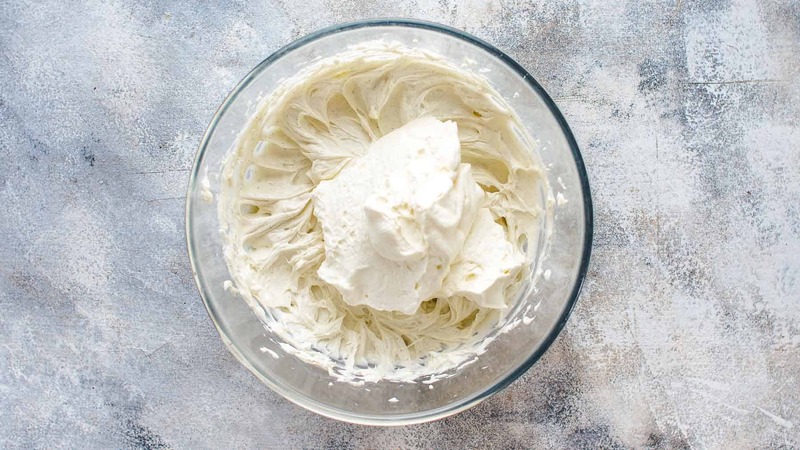 How to fold whipped cream into cream cheese? Use a wooden spoon and start at one o’clock when working with the right hand and at eleven o’clock with the left hand. Then scrape the spoon down the side of the bowl until you are at the bottom of the bowl. Scrape along the side of the bowl until you see the spoon again. The spoon should be at seven o’clock when folding with the right hand and at five o’clock with the left. Then fold over the top. Turn the bowl a little and repeat. Stop immediately when the filling is incorporated. Add blueberry sauce and fold into the cream cheese filling. Now you are already a master in folding, right? Just do it the same as with the whipping cream. Stop when the filling is incorporated. Leaving some white and purple stripes and dots is okay. Just don’t overwork the filling to keep the fluffy texture. Transfer the filling to the chilled crust and spread evenly. Chill at least 4 hours but preferably overnight. It needs its time to set. It’s best eaten on the next day. So, don’t rush on chilling. Do not shorten the chilling time by placing it in the freezer. It would have a negative impact on the filling. You can prepare the sauce and the crust up to 2 days in advance. Store both in the fridge until you use them. 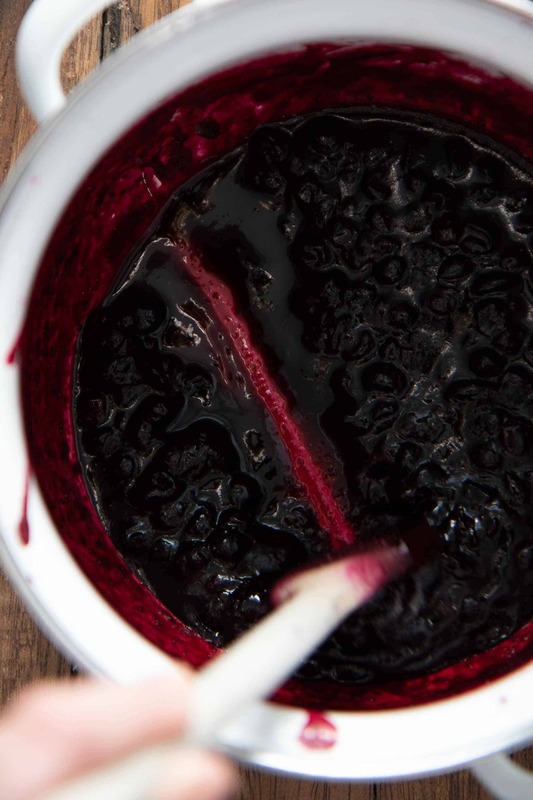 You can replace the homemade blueberry sauce with 2/3 cup of blueberry jam or preserves. Not in the mood for an Oreo cookie crust? No problem, try my no-bake graham cracker crust. 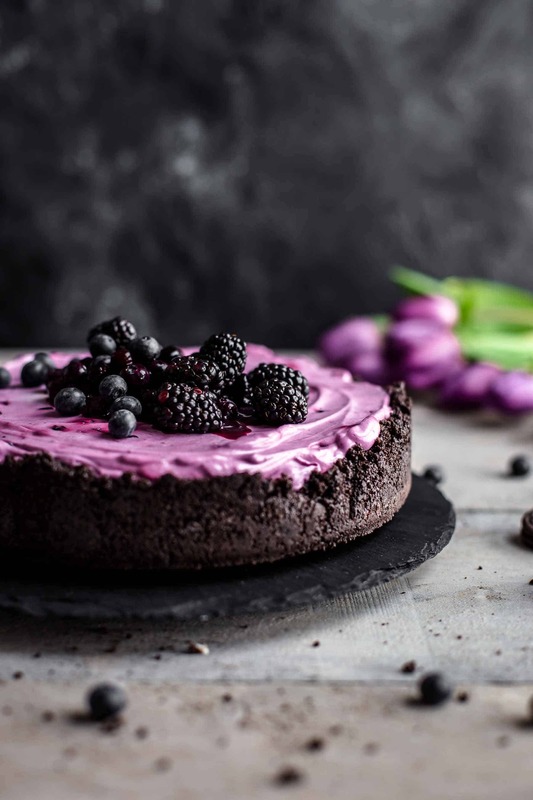 How to store No-Bake Cheesecake? Store no-bake cheesecake in an airtight container in the fridge and no longer than 30 minutes at room temperature. If it is very warm and humid in your climate zone, avoid to store it longer than 15 minutes at room temperature before serving. The filling would get too soft and could begin to spoil quickly. 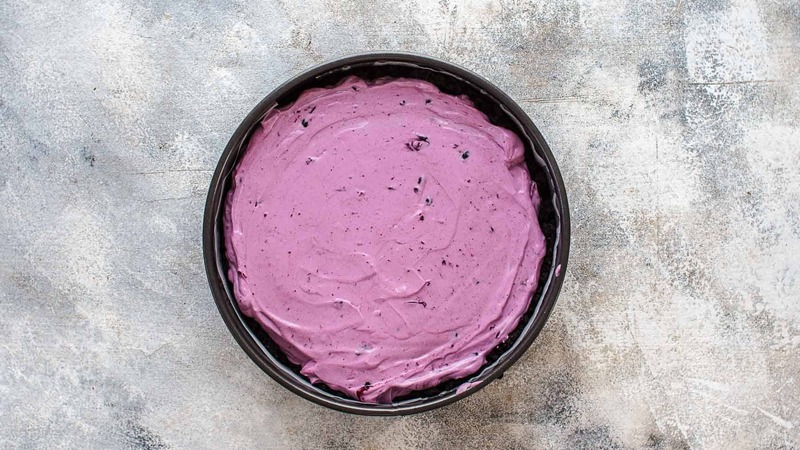 Can I freeze No-Bake Blueberry Cheesecake? No, I don’t recommend it because of two reasons. First, the blueberries in the filling would get mushy after freezing and thawing. And second, the texture of the filling is not that smooth anymore. If you are worried that you don’t finish the cake and waste food, it would be better to make a small batch of this recipe. 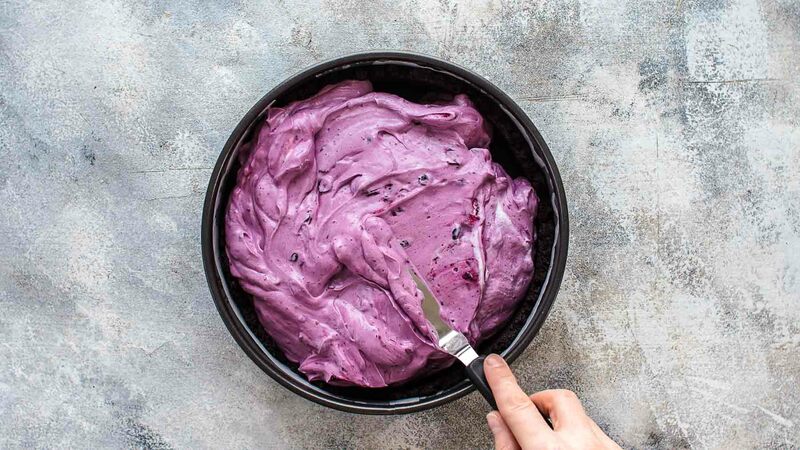 Simply divide the recipe in half and make it in a 6″ springform pan or a muffin pan and make Mini No-Bake Blueberry Cheesecakes. 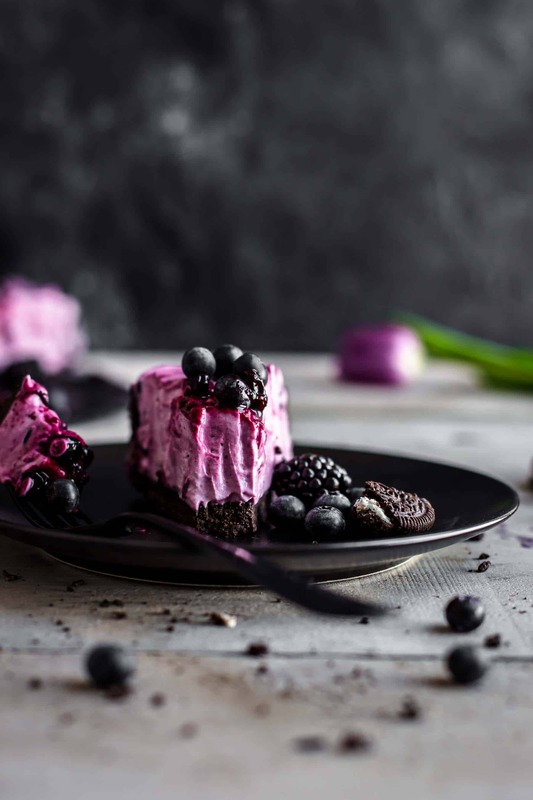 If you make this No-Bake Blueberry Cheesecake recipe leave a comment, rate it and tag a photo #alsothecrumbsplease on Instagram! Would love to see your snap! Check out all my other recipes! I’m sure you will find more recipes which you like. Sauce: In a heavy bottomed pot, combine all ingredients and bring to a simmer over medium heat. Cook until the blueberries are soft and the sauce has thickened up and is reduced by 1/3, about 5-7 minutes. Let cool to room temperature. 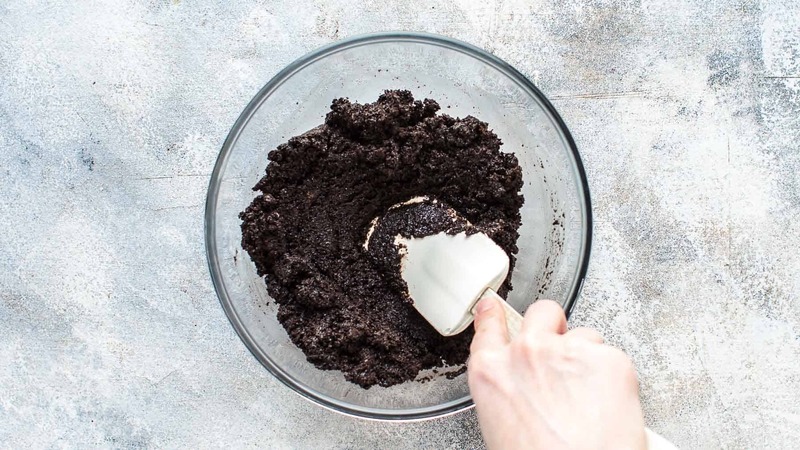 Crust: In a large bowl, stir together Oreo crumbs and melted butter until combined and evenly moist. Transfer to the prepared pan and press crumbs into the bottom and halfway up the sides with the back of a flat-bottomed cup. Freeze until filling is done. 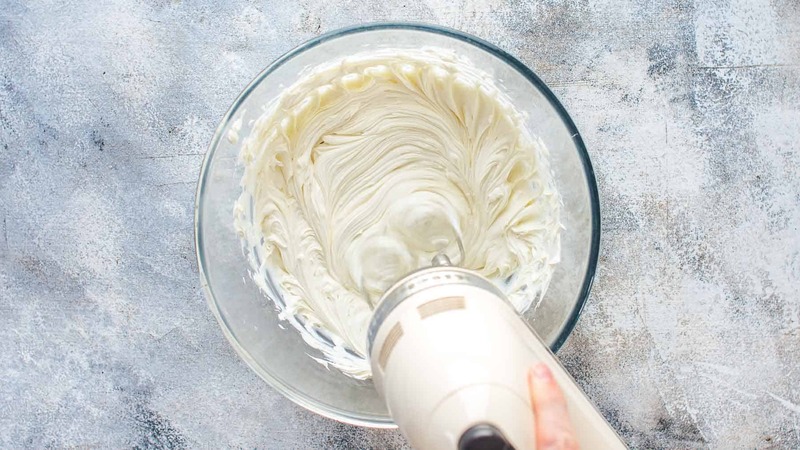 Filling: In a large bowl, using a handheld or stand mixer fitted with a whisk attachment whip heavy cream on medium-high speed until stiff peaks form for about 2 minutes. Set aside. 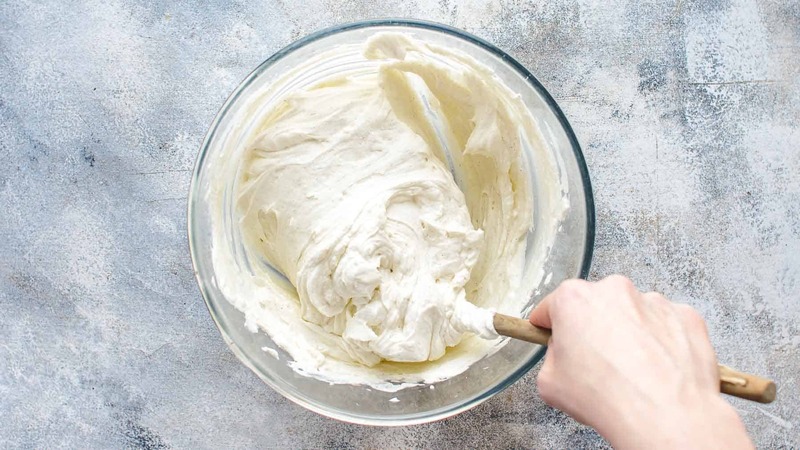 In another large mixing bowl beat cream cheese on medium speed until creamy for about 1-2 minutes. Add sugar and vanilla* and mix until smooth. Carefully fold in heavy whipping cream just until incorporated. Fold in the blueberry sauce just until combined. Transfer filling to crust and spread evenly. Chill in the fridge for at least 4 hours or until firm (preferably overnight). Store leftovers in an airtight container in the fridge up to 2 days. Watch step-by-step photos in the blog post above to see the required consistencies at every step to have full clarity. Watch the 54 seconds video to see the whole process. 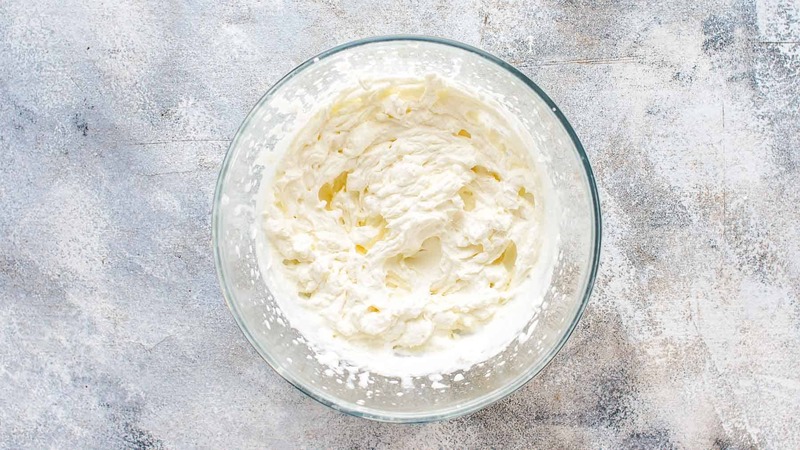 Read the blog post for additional information on substitutions, how to fold whipping cream into cream cheese, etc. Do you think that this could be done with strawberries? Yes, absolutely! You can substitute 1:1.